While constructing the movie Spellbound Alfred Hitchcock was absolutely bursting with ideas. 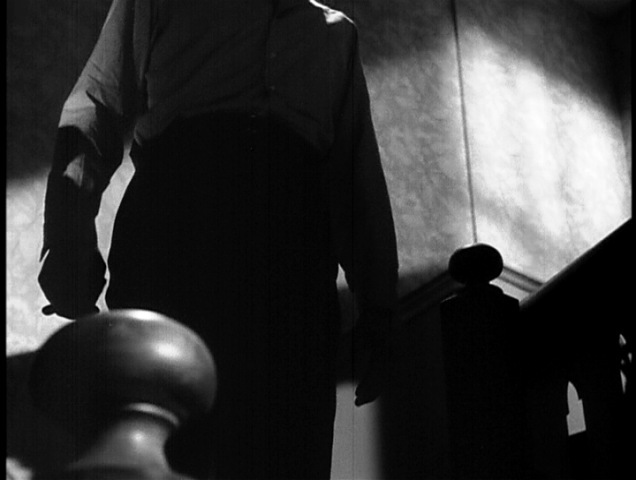 In this piece I would like to take a look at one sequence that is full of ideas, and also incorporates many of Hitchcock’s favorite visual motifs in one sequence: montage, the long take, and the subjective point of view. This sequence takes place at the house of Dr. Brulov. It lasts around 5 minutes and 3 seconds, with 22 pieces of film. We begin with a fade-in from black. 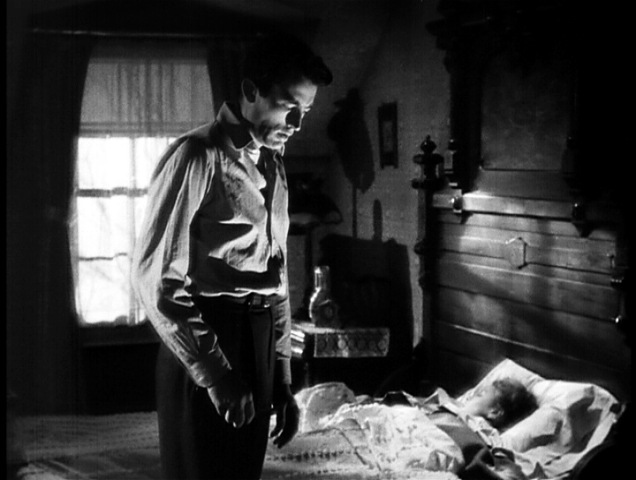 Gregory Peck’s character wakes up at the foot of the bed, gets up, walks to the bathroom and turns on the light. This runs around 55 seconds with no cuts. 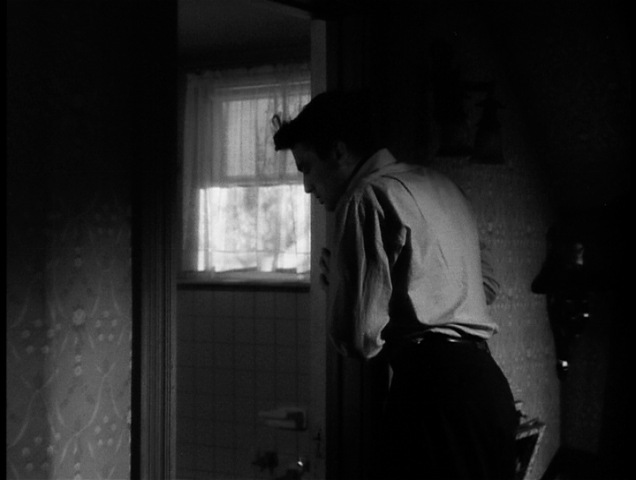 The first cut is a very nice reverse as Peck flicks on the light; from being outside the bathroom, in shadows, we are now inside the bathroom in bright light. 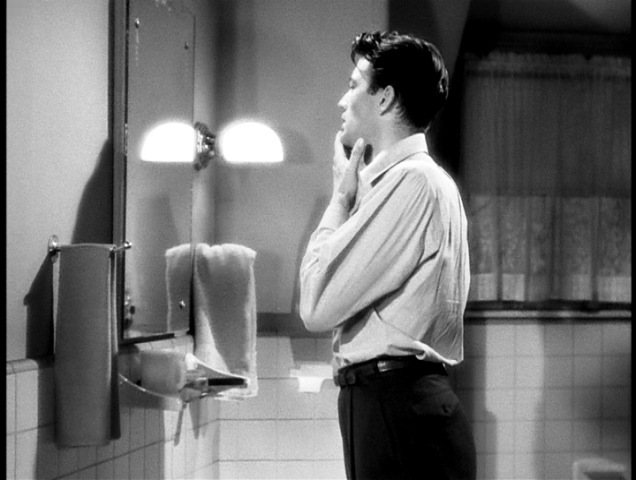 Peck walks to the sink, in a dreamlike state, drinks water, looks and touches his face, sees shaving apparatus and begins to lather up to shave. This all takes about 53 seconds with no cut. At this point, after two long takes that run about 108 seconds combined, the cutting increases dramatically. There will be 12 editorial cuts in the next 30 seconds. As the cutting shifts into high gear, the point of view changes as well. Hitchcock now employs his subjective POV. 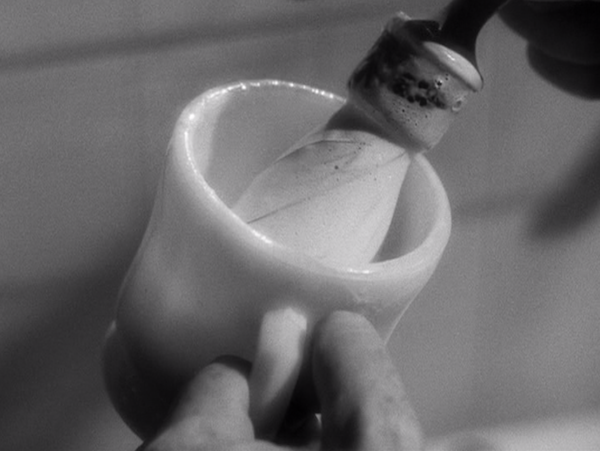 Our first subjective shot is a close-up of the white shaving cup. Hitchcock then cuts to Peck hastily putting the cup down. Then we get a quick series of images and reaction shots, as Peak swivels his head around the room, overwhelmed by the bright white surfaces everywhere. First he looks at the white sink. 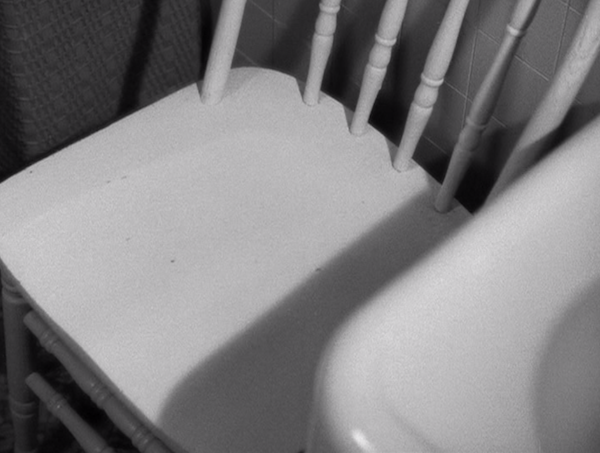 Then he looks at the white chair to the left of the sink. Next he whirls around and notices the white counter top, upon which even the jars are white. 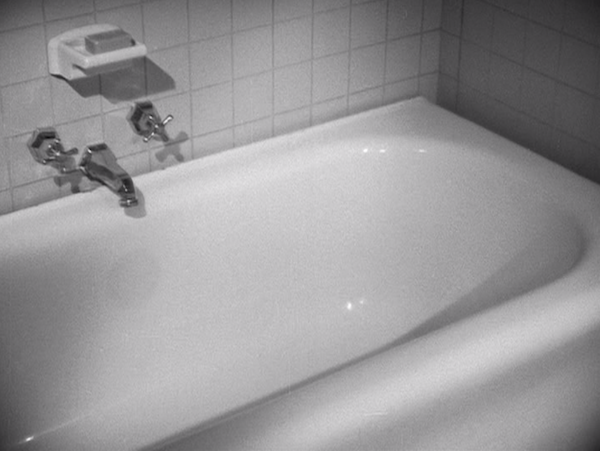 And finally he turns to the white bathtub. He walks out the bathroom door, and we cut again on a reverse. 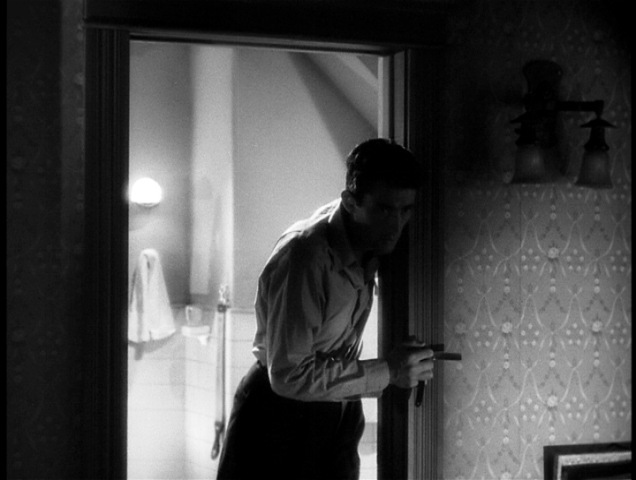 Peck is back in shadows, only now he is holding the razor blade in his hand. At this point the cutting slows down, heightening the tension. 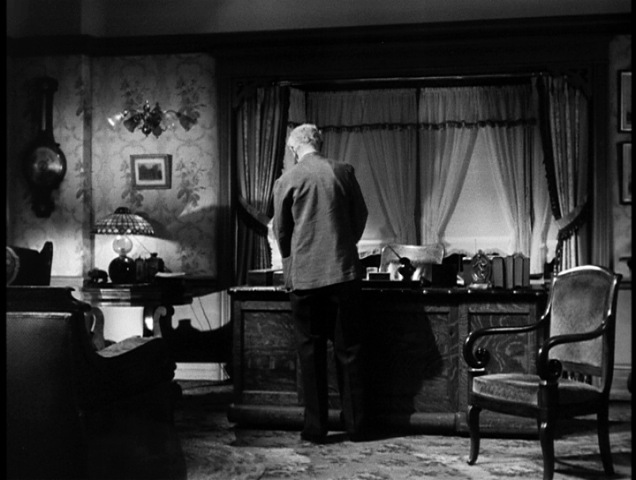 Hitchcock returns to the subjective POV as Peck looks at the white bedspread, following it up to the sleeping face of Ingrid Bergman. 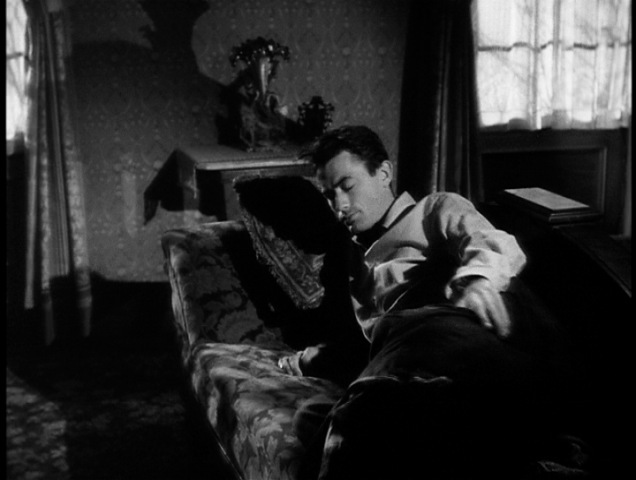 Peck slowly walks into the room, moving close to Ingrid Bergman, the threat of the knife still visible in his hand. 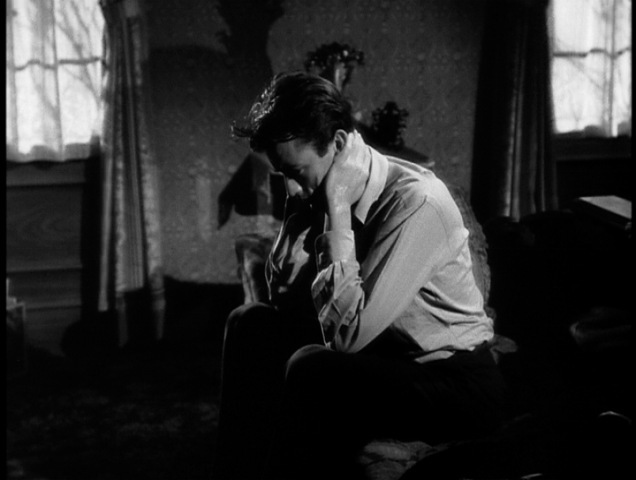 Hitchcock cuts to a close-up of Bergman, highlighting her vulnerability. Will the sleepwalking Peck kill her? Instead Peck walks out the door to the landing. 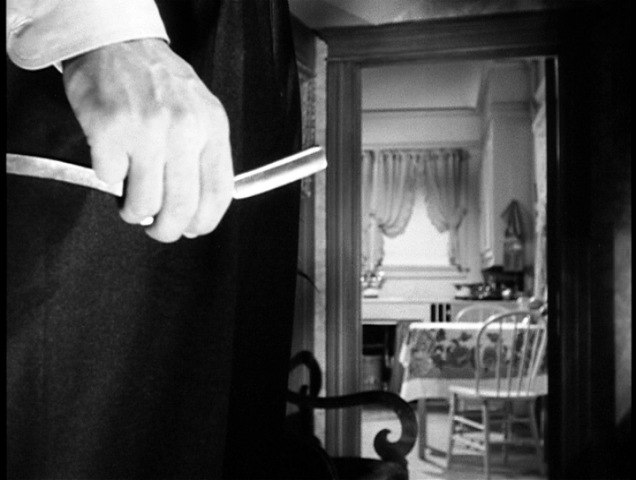 Then Hitchcock employs a fantastic shot, in which Peck walks downstairs, razor in hand, and walks into a closeup on the razor. This lasts around 35 seconds without a cut. Then begins the longest shot of the sequence, running around 75 seconds without an editorial cut. 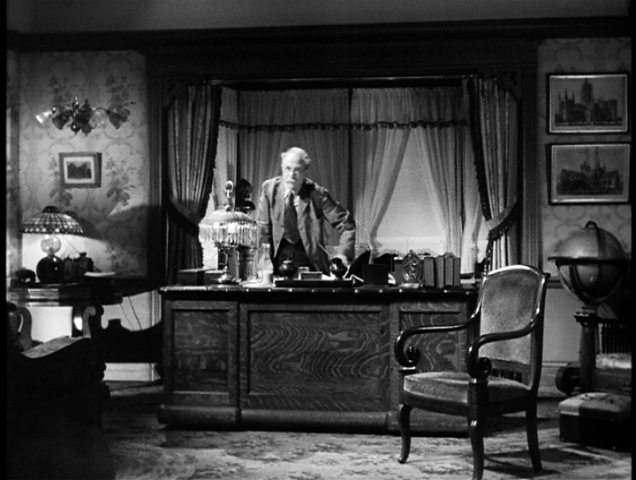 We start with a subjective POV shot of actor Michael Chevhok, as Dr. Brulov, at his desk. Chekhov walks up to Peck, the visible threat of the knife gleaming. 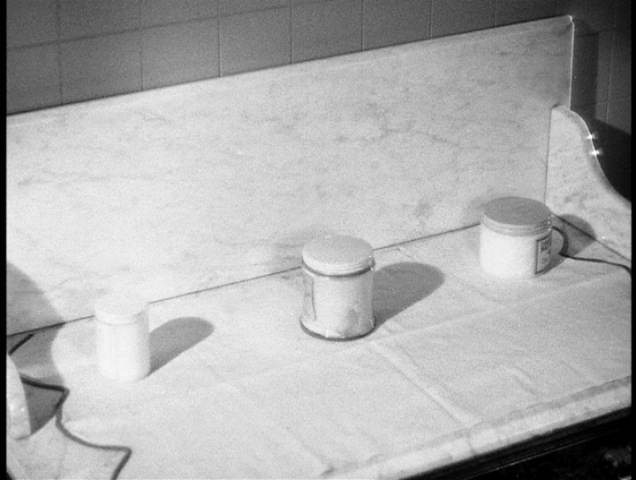 The camera turns to follow Chekhov as he walks into the kitchen and out of frame, although we can still hear him talking. He then walks back into frame. This entire time, the razor is prominently displayed. 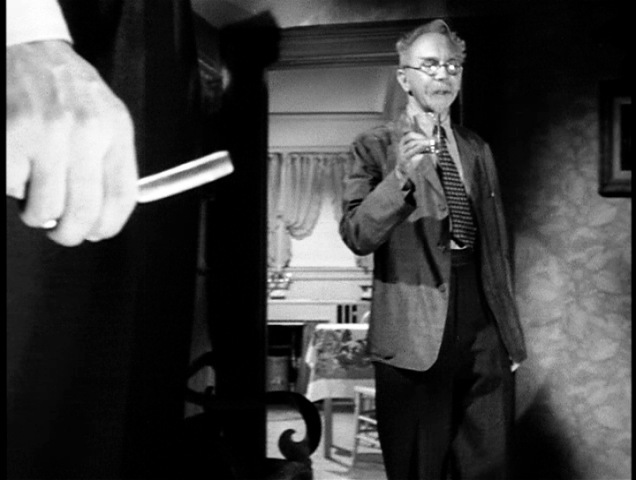 The camera then turns to follow Chekhov back to the desk, returning to a subjective point of view without cutting. Chekhov has his back to the camera as he pours the milk (to disguise the fact that he is drugging it, as we will learn later). He then walks back and hands the glass to Peck. All of this happens with no editorial cutting. 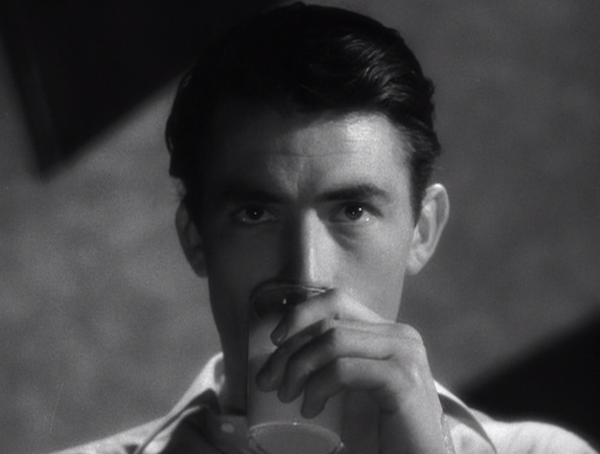 Finally we cut to a reverse of Peck as he prepares to drink the milk. The sequence ends with this very clever shot, a POV shot seen through the glass of milk! As the glass tips up, the frame turns to white. And as the sequence began on a fade-in from black, it ends on a fade-out to white. A fitting end, since white is the color that triggers Peck’s episodes. 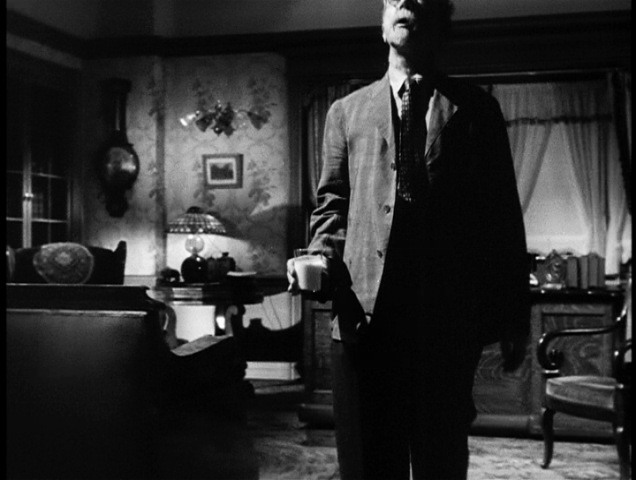 In a span of only five minutes, Hitchcock heightens the tension of the scene by employing several techniques. 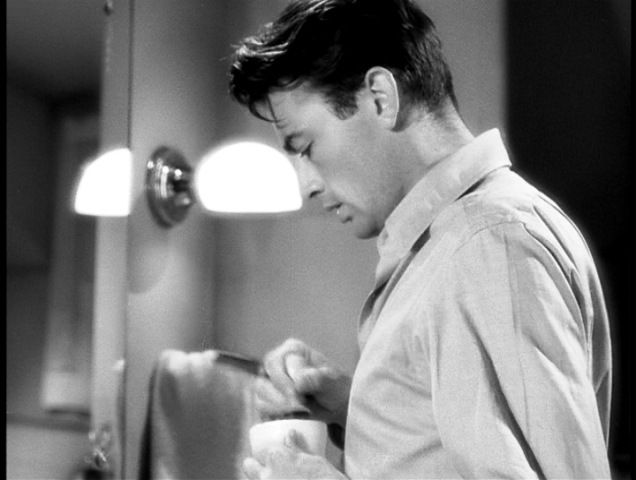 First of all in the cutting, which begins with long takes, then moves to a short montage of quick cutting as Peck reacts to all the white objects in the bathroom, and finally stretching out again to longer takes at the end. He also creates tension through the prominent placement of the razor in the frame. 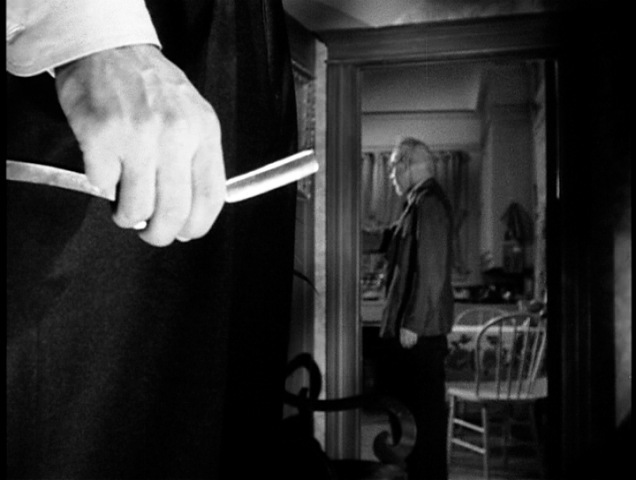 It is never used (or even held) in a threatening manner, but it feels menacing because of how it is shot, and lit. 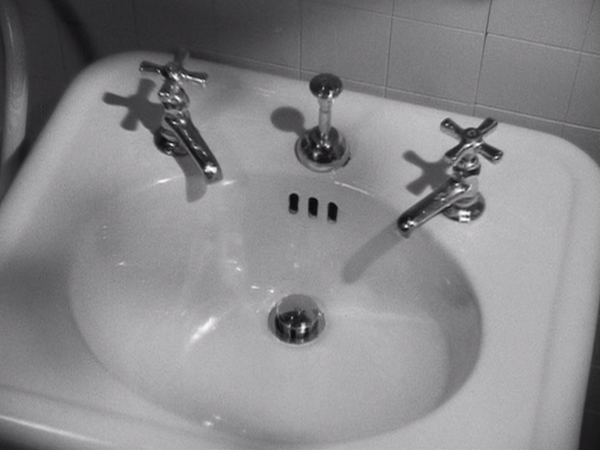 And finally tension is heightened through the use of clever subjective POV shots. Here is one way of making drama out of camera angles. 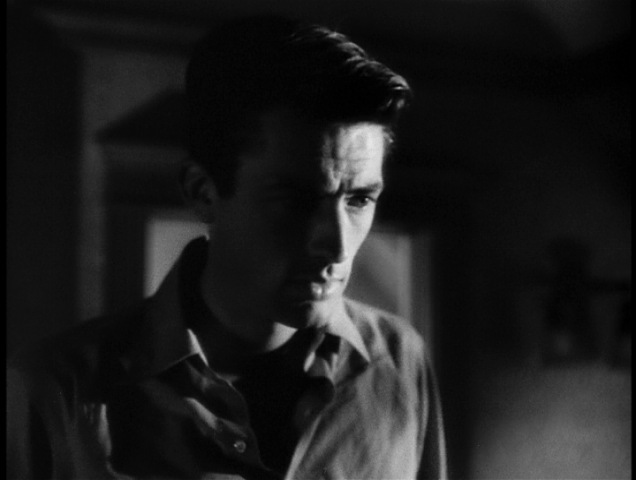 In Spellbound you’ll remember the scene where Gregory Peck comes down a curving flight of stairs with an open razor in his hand…Now, in that scene I hardly move the camera at all. It is placed facing the stairs and Gregory walks right into the camera — right into the audience. As he gets closer his face and shoulders fade from the lens until all you can see is the razor in his hand. Then the camera moves. But there’s no dialogue and really very little movement. 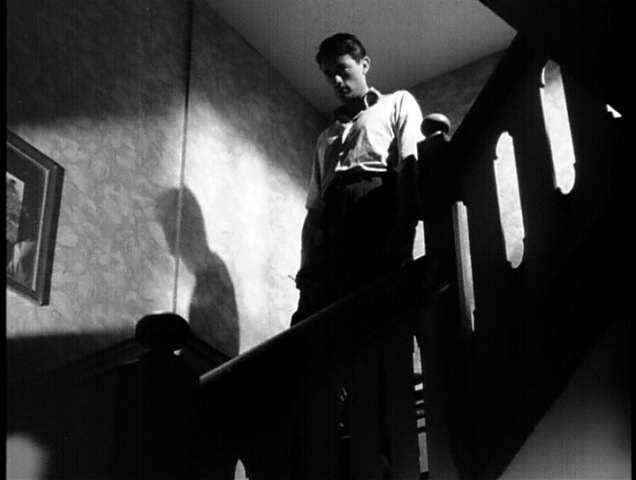 The whole scene depends on suspense and the use of camera. We pan to the doctor and hold him while he talks to Gregory…The doctor moves off to give him a glass of milk –which, incidentally, he dopes — and the camera stays with Gregory. Back comes the doctor and hands him the glass of milk. 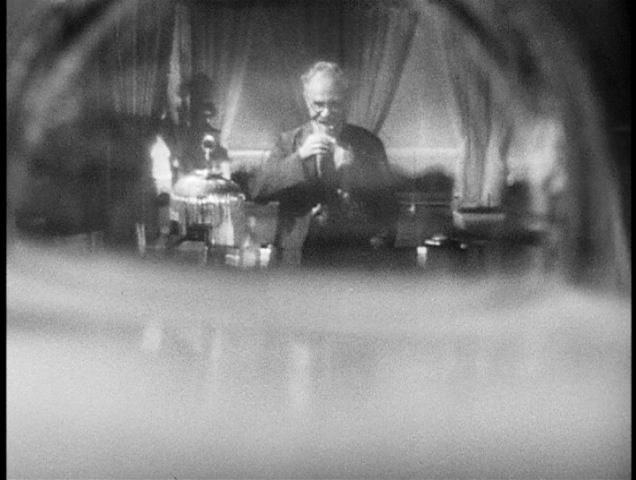 The camera moves to a back shot, so that the audience is behind his eyes as he drinks. You get the impression of the white liquid obscuring his sight as he tilts the glass. This is doubly effective because in the film white is the color which affects his mind. The secret of good directing is to remember that you are telling a story visually. Your medium is that of sound and sight. The screen should tell this story as much as possible — not the dialogue.